As discussed in part 1 of this series, the list of players whose careers turned out to be a big waste of their potential is too long. Even if we narrow our category down and exclude as many players as possible, it will still be impossible to cover all of them in one article. So picking up from where we left off yesterday, we are going to look at three other players who ended up wasting their astronomical potential for success. If you just go back and look at Coleman’s career stats and see that he averaged 16 points and 9 rebounds for 14 NBA seasons, you might think that he had a solid NBA career and he shouldn’t be on this list. But for someone who had a legendary college career at Syracuse University and who was expected to become the greatest power forward of all time after being drafted first overall, his talents were obviously wasted. He was infamous around the NBA for being out of shape almost all the time and playing just hard enough to fill up the stat sheet. He never gave it his 100 percent and Sports Illustrated Magazine summarized his playing style most succinctly, he just played good enough to earn his next paycheck. Coleman repprtedly even enjoyed not making the playoffs so that he can have some extra time off during the summer. He was unanimously disliked by all NBA coaches since he had all the potential in the world and yet no desire to work towards becoming an NBA great. Beasley was a superstar in high school. He averaged 28 points and 16 rebounds as a high school senior and a mind boggling 26 points and 12 rebounds during his freshman year at Kansas State University. He was one of the most dominant players in the country at that time. He broke 30 records during just one season with Kansas State. He entered the NBA Draft and was selected 2nd overall behind future league MVP Derrick Rose. He was so good during his time in college that the first pick of that draft was considered a toss up and people believed that a team couldn’t lose with either Rose or Beasley. However, he started getting into trouble soon after entering the league and just couldn’t stay off the weed. He was caught in possession of marijuana as a rookie and in a more infamous incident while he was with the Phoenix Suns, which led to him being waived from the team. 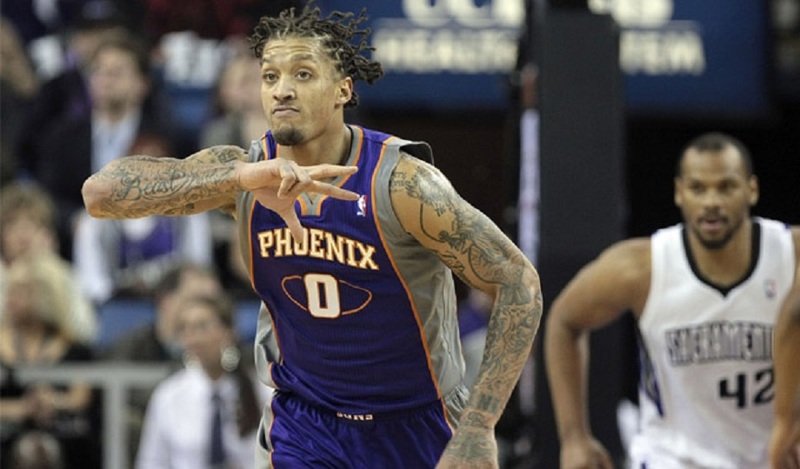 Since his time with the Suns, he has just bounced around the league from team to team. He is currently a member of the Los Angeles Lakers and this season he wore the wrong shorts to a game and was sent back to the locker room to change. This prompted more jokes about his usage of marijuana, especially now that he plays in California, a state where buying, selling and consuming marijuana is legal. After playing competitive basketball for the first time at the age of eighteen, it was incredible how Michael Olowokandi climbed the draft chart for teams and ended up being the first overall pick of the NBA Draft. It was extremely surprising that in a draft class which featured future hall of famers like Dirk Nowitzki, Paul Pierce and Vince Carter, an unproven center who had only played three years of organized basketball, was chosen first. This has ensured his position as being one of the greatest draft day busts of all time. However, it wasn’t supposed to end this way. The same year he was drafted by the Los Angeles Clippers, the team’s coach was the greatest center of all time, Kareem Abdul Jabbar. However, instead of learning from Jabbar, Olowokandi did the opposite. According to Jabbar, Olowokandi was almost uncoachable. Whenever Jabbar tried to point out some mistakes in Olowokandi’s game, he would take it as an insult and believe that Jabbar was only trying to make Olowokandi look bad in front of his teammates. At one point, he even walked up to Jabbar and said, “I will not be criticised in front of his team.” So instead of being one of the best centers of his generation, Michael Olowokandi ended up being one of the biggest athletically gifted washout in NBA history. Most of the highlights featuring Olowokandi usually feature him being dunked on by a vastly superior player.